We’re celebrating the release of Transformed by giving you a deeper look at some of the stories and authors! Monday, July 16: Gretchen Bassier (Scars) is interviewed by Erotica For All. Tuesday, July 17: Clint Collins (Stranger in Town) discusses the challenge of writing erotics on Chapter Break. Wednesday July 18: Meg Archer discusses her story Red-Tail and our own animals within on Tiffany Michelle-Brown’s blog. Thursday July 19: Nancy Canu discusses what led to her story Fathom on Wopsywoo Book Blog. Friday July 20: Jaap Boekestein (Wolf Chest) is interviewed on Cobalt Jade’s blog. Editor Charlie Waston takes us into the creation of the anthology on Cori Vidae’s blog. 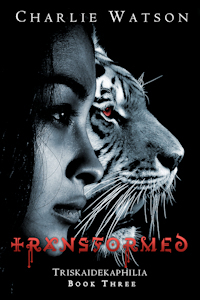 Get Your Copy of Transformed Today!